Let them eat crème brulee, macaroons, and crepes! On Sunday, July 10, from noon until 5 o’clock, there was no revolting. Instead, New Yorkers willingly obeyed Marie Antoinette and ate. An annual free, French extravaganza, entitled Bastille Day on 60th Street between Lexington and Fifth Avenue, hosted approximately 60 vendors that stretched for three avenues. Loads of French culture, tempting smells of crepes topped with strawberries and nutella, live French music, and delicious French delicacies were bought and devoured by ecstatic crowds in Midtown. Food, and more food, seemed boundless at Bastille Day. From free chocolate from Switzerland offered by National Geographic to a venue entitled Mad Mac that sold combinations of French macaroons like French Classic, Chocolate and Fruits, and an American Favorite that included hazelnut, cinnamon, peanuts, and white chocolate, there wasn’t much to complain about. Luckily, not every delicious delicacy cost money; one could find almond cake and a cup of soothing Kusmi Tea for free. Brassiere Les Halles sold amazing and affordable iced coffee beverages such as iced macchiato, iced cappuccinos, and much more. Along with coffee, choices of pastries and desserts were absolutely endless. Brassier Les Halles also offered crème brulee, coconut meringue, chocolate flourless cookies, peach and blueberry crumble, éclairs, and Napoleons. Cafe Cognac‘s lines were longer than life; peach and strawberry tarts, along with tasty tuna Nicoise sandwiches kept customers coming back for more. But, the longest lines seemed to belong to The Crepe Escape, which sold an appetizing variety of crepes including flavors like blueberry, banana, strawberry and nutella — sugar and more sugar. Who could ask for more? For fifteen dollars, The French Institute Alliance Franciase also offered scrumptious wine tastings and cheese samples at the Tinker Auditorium from 12 – 4:30 p.m. Samples of wines included summer wines such as, “Provence rose, red, and white wines provided by Vins de Provence,” along with French cheeses such as, “Societe Roquefort, Le Chatelain Brie, and Seriously Cheddar.” However, wine and cheese weren’t the only samples offered. Cocktails including a “Cranberry flavored French Kiss,” and beers such as, “Pietra chestnut amber ale,” were also on the menu. Street entertainment including the “Citroen Car Show,” on the Corner of 5th Avenue and 60th Street offered viewings of French vintage cars and motorbikes. 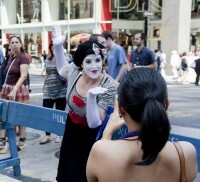 Within “Art on the Street,” located between Park and Lexington Avenue, a friendly man with an accordion played festive French tunes, along with a beautiful French mime that blew kisses and took pictures with several French fans. But, adults weren’t the only ones enjoying what Bastille had to offer. Children were having a ball as well. The “Kids’ Corner,” between Madison and Fifth Avenue, enabled the opportunity for a family debut, offering “storytelling, arts and crafts, games,” and a “Kids’ Pentanque Contest,“‘ where children could experience a classic French game. Glamorous French roses sold by Ode a La Rose were also bought for loved ones; their slogan “Spread Some Love. Use Roses,” seemed to resonate in many people experiencing and enjoying Bastille Day. But aside from the culture, food, and musical performances that Bastille Day offered, there is a larger, more significant notion at play. Bastille Day’s existence serves as a tool to rectify a relationship with the United States. Through bringing French culture, knowledge and art to those who have never experienced it, one can truly understand and appreciate what the French have to offer.